THE Bengali month of Falgun is associated with romance, as it initiates the season of spring. Pahela Falgun (February 13), the first day of spring is celebrated in our culture with much gusto. The recent trend of celebrating Valentine's Day (February 14) in our urban areas has made both the occasions more significant. 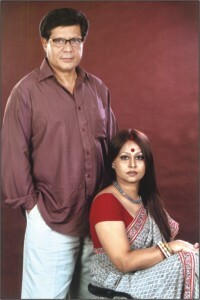 On this amorous occasion, The Daily Star talked to eminent cultural personality Pijush Bandyopadhyay and his wife, theatre and TV actress Joya. �We've known each other for quite a while but it didn't begin with romance. We were friendly with each other, as co-artistes should be. I liked her acting. It was the residential camp at Chittagong for the play, Meenkonya, where we first got the chance to get to know each other,� said Pijush. �There was no such formal proposal, but definitely I asked for her hand in marriage. I was lonely and I urged for a peaceful, loving home� Pijush says. �We have some common interests, one being that we both enjoy travelling. Together we have travelled throughout the country and overseas, and it really means a lot to me. From the world cup football tournament to the place where Shakespeare's Romeo and Juliet were said to live� As Pijush is involved with Gram Theatre, I also had the opportunity to visit the remote parts of our country, which is quite interesting,� Joya seemed lost in memories. How does it feel to act with each other? �Recently I had an interesting experience. We've acted together in the drama serial Shonkhobash, aired on ntv. Pijush played my brother-in-law and had to call me 'bhabi' throughout the play. It really made our neighbours 'curious' and whenever they'd meet me, they asked me about it. Personally, I have no issues regarding acting with him, no matter what my character is,� Joya says. Do they have their differences and do they argue? �Joya is a perfectionist when it comes to her kitchen and house-hold, I try not to poke my nose in it,� Pijush affirmed. �Another thing that is quite irritating is when Pijush's female admirers (he has many) virtually ignore me and at times even hand me a camera to take their photos.� Joya scowls. �As a husband, Pijush is very caring and as a person he is well-rounded. Did I say that right?� Joya smilingly asks Pijush.